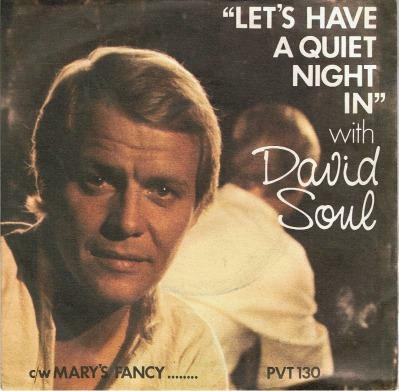 If you're of a certain age, then you will certainly remember David Soul when he was an international TV star, pop star and pin-up back in the 1970s. Young lads wanted to be him and young girls had a crush on him, although they had to suffice with adorning their bedroom walls with posters. Of course, David Soul is best known for his role as one half of the TV cop duo Starsky & Hutch, with the other half being Paul Michael Glaser as David Michael Starsky. Soul played the part of Kenneth Hutchinson between 1975 and 1979. It was during this time that he decided to embark on a pop music career, although this wasn't his first attempt. Soul developed a passion for music after learning to play guitar with the help of his fellow students at the University of the Americas in Mexico City. After finishing his education, Soul decided to pursue a career as a singer, but like many wannabe music stars, found himself drifting back into acting in order to earn a decent living. In 1966 and 1967, Soul appeared on The Merv Griffin Show as "The covered man", in which, he wore a mask while singing. However, in 1967 he made his first TV appearance in the Children's adventure series Flipper and for the next ten years it was in acting that Soul would make his name. It wasn't until he had found fame and fortune wityh his role in Starsky & Hutch that Soul would finally receive accolade for his singing talents. Taking advantage of his celebrity status, Soul released his debut single "Don't Give Up On Us" in 1976 which became a worldwide hit. The track was written and produced by the American composer Tony Macauley and reached No.1 in the U.S. for one week. The single spent a more impressive four weeks at the top of the charts here in the UK selling 1.16 million copies. 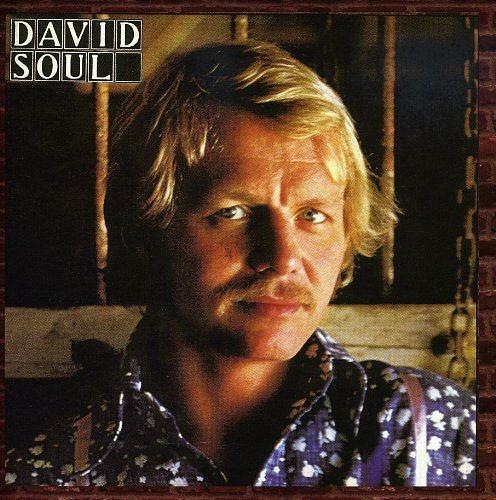 Indeed, despite being a one hit wonder in his home country, it was in the UK that David Soul gained the most success, with five hit singles and two hit albums. During his time in Starsky & Hutch, Soul was in a relationship with the American actress Lynne Marta and divorced his second wife, Karen Carlson, in 1977. Marta was also a singer, and was invited to sing a duet entitled Black Bean Soup for the B-side of Don't Give Up On Us. 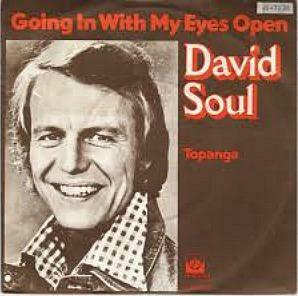 David Soul's self-titled debut album was also a major hit, reaching #2 in the UK and #8 in Australia. 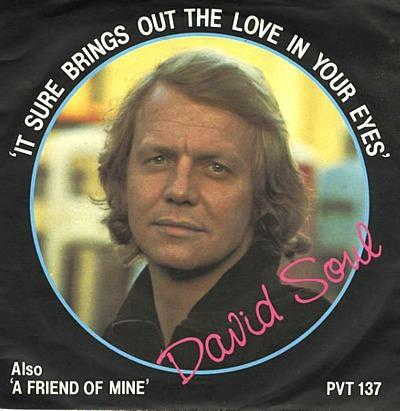 Going In With My Eyes Open was the second single release by David Soul, peaking at #2 in the UK singles chart and #54 in the U.S.
Third single, Silver Lady, spent five weeks in the UK top ten before finally grabbing the top spot, where it stayed for three weeks during October 1977. Mr. Soul must have been very satisfied to have replaced one of the most commercially successful artists of all time, Elvis Presley, at the prestigious top spot. Although, he would have been less satisfied when Baccara's Yes Sir, I Can Boogie knocked him off his perch. 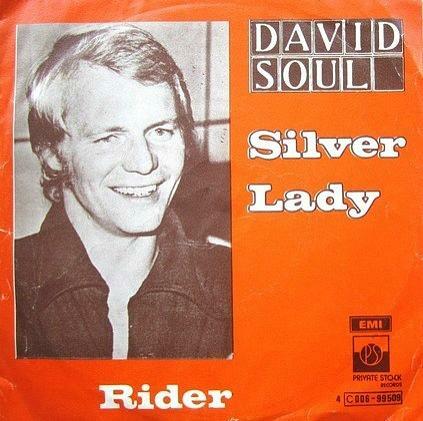 Silver Lady was lifted from Soul's second album Playing To An Audience of One which reached #8 in the UK, but wasn't a hit in the U.S. The singer released three more albums Band of Friends (1979), The Best Days of My Life (1982) and Leave A Light On (1997) but they all failed to chart. 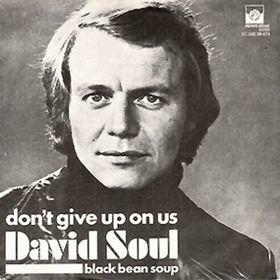 David Soul has been living in England since the mid 90s and currently lives in London with his fifth wife, Helen Snell, who he met in 2002. He became a British citizen in September 2004. Fourth single Let's Have A Quiet Night In reached #8 in the UK in 1977. 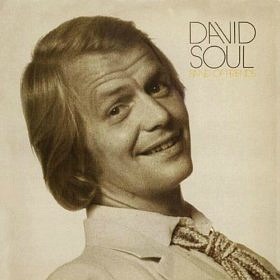 David Soul's fifth and final hit single peaked at #12 in the UK during 1978. Released in 1979, the singer's third album, Band of Friends, failed to emulate the success of his previous two albums and failed to chart.